Social media provides an invaluable means of promoting TV content. But which social network is the right one? 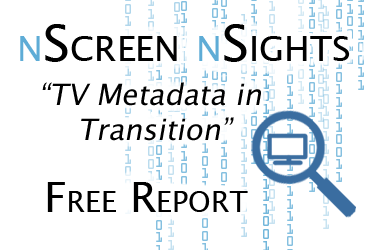 New data suggests TV networks are overlooking a big opportunity with Instagram! Facebook boasts the highest number of TV fans. However, most of the social giant’s growth in that demographic comes from the company’s 2012 acquisition of Instagram. 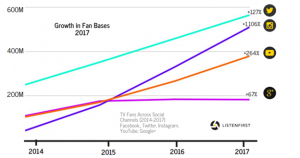 According to ListenFirst, Instagram has grown its TV fan base more than 12-times, or +1,106%, since 2014. 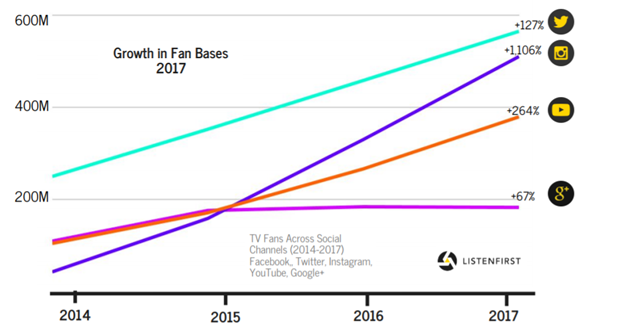 YouTube, which enjoyed the second fastest growth among TV fans, grew 5-times less quickly than Instagram over the same period. Consumers engaged with TV content on social networks a total of 4.9B times in 2017. On Instagram consumers engaged with TV content 62% more than the previous year. 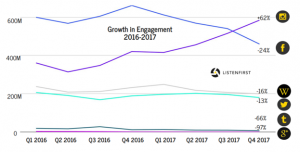 With more than 600 million TV engagements, Instagram was the only social platform to see growth. Google, Twitter, and Facebook all saw declines in likes and comments about TV content. The number of posts by cable and broadcast companies remained the same between 2016 and 2017. That said, the TV networks are adjusting where they post, though the changes reflect neither the relative importance of each platform nor the rising importance of Instagram. Twitter still receives the highest number of TV posts, with 663,000, though this was down 16% from 2016. Facebook was the second most popular site for TV posts, and post volume increased 9% over the previous year. Instagram, however, saw only a modest 4% increase in the number of posts from last year. Looking at Nielsen data suggests TV networks are doing the right thing in switching focus to Facebook from Twitter, though they should probably move much faster. The average total number of interactions per episode of The Walking Dead on Twitter and Facebook in the 2016-2017 season was just over 2 million. However, Facebook drew more than 5-times more interactions than Twitter. The story is the same for other big hits like Empire and The Bachelor. However, TV networks should move faster to embrace Instagram. With 12-times the TV audience growth of other social networks, there is more opportunity and less competition for TV Network advertisers there. Prioritizing Facebook and Twitter over Instagram could be a big mistake by TV marketing executives. 64% of Instagram users are between the ages of 18 and 29 years-old. This millennial age group is moving rapidly away from traditional television. According to Nielsen data, TV viewing time among the 18-24-year-olds is down a third since 2014, and down a quarter in the 25-29-year-olds. Instagram has over 800 million users and is expected to reach over a billion monthly users this year. Getting the Instagram audience involved in the conversation around TV now could be a great investment as the community grows. It can also help keep existing young TV viewers and bring some back. However, rather than relying on monetizing a viewer once they come to watch the shows on television, there could be an opportunity to earn revenue via Instagram more directly. Branded TV network content grew 30% from last year, though it represented less than 1% of all posts. According to ListenFirst, response rates for branded content is 42% better than non-branded content. As well, branded TV content on the network’s Facebook page generated, on average, 9-times more engagement than an advertiser generates on its page. Using a hashtag in the video can further enhance its value to brands. Most brands don’t use them, but a post with at least one hashtag receives, on average, 12.6% more engagement. These hashtags don’t necessarily have to be the company name. They can be anything a user can relate to, like a movement, slogan, or trend. Ad revenue on Instagram is expected to increase from $1.86 billion, in 2016, to $6.84 billion, in 2018, this year. With more emphasis on Instagram, TV networks can tap into that growth and offset some of the ad revenue declines due to falling TV viewership. TV networks are using social networks to generate buzz about their shows. New data suggests they aren’t prioritizing the social networks correctly and are neglecting Instagram. They are missing the opportunity to connect with and monetize the elusive millennials. Branded content – when a third-party sponsors content published by a media property and has its brand image integrated into the content.